Dell Inspiron Windows 10 laptop is elegantly designed and is light in weight so that you can carry it with ease. This Dell Inspiron 8GB RAM laptop is reliable.Make every experience more intense real and intensive with the Dell Inspiron 7570 Laptop. It is designed keeping in mind the need of the gaming audience,and packs in an Intel Core i7-8550U processor for quick and efficient performance. The 4GB GDDR5 NVIDIA GeForce 940MX graphics memory gives it some serious computing power, making it perfect for your gaming and video-editing needs. This Dell Inspiron Windows 10 laptop comes with 1TB of internal storage that lets you store lots of files, documents, movies, and much more, at a single place, while the large 3-cell battery promises to give you long hours of trouble-free use. Moreover, it features a standard backlit full-size English keyboard that is spill-resistant. 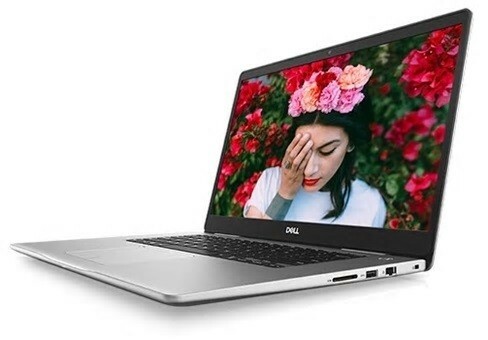 This Dell Inspiron 8GB RAM laptop features a built-in infrared camera that works with Windows Hello for secure facial recognition. The elegant thin-bezel design gives you added screen space for those captivating visuals while the 15.6inch FHD IPS display lets you view your screen from a wide range of angles without sacrificing on the image quality. The various ports on this Dell Inspiron 15.6inch laptop allow for excellent connectivity while the Bluetooth and Wi-Fi provide for an added convenience.